The terms survey and questionnaire are often used interchangeably, however there is a significant difference between the two. Survey – the general collection, recording, and analysis of information on a specific topic from a group of individuals in order to measure opinions, thoughts, or experiences. Questionnaire – a form containing a set of written questions designed to obtain statistically useful information from individuals. 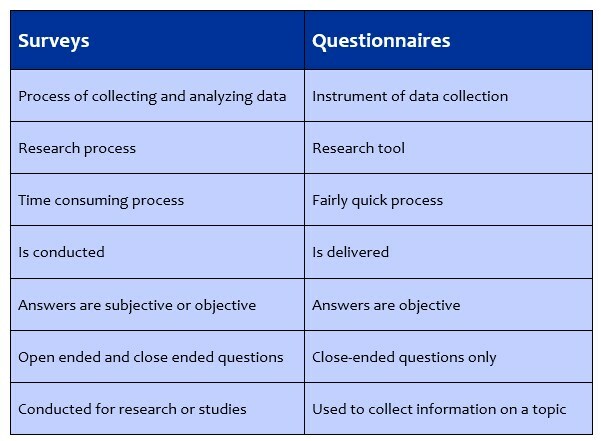 These two are similar in that they both are methods used to acquire data from respondents based on questions. However, a survey encompasses all aspects of the research process, including design, survey construction, sampling method, data collection and analysis. A survey gathers the results of multiple questionnaires from a set group so that a statistical analysis can be conducted on the aggregated data. A questionnaire, on the other hand, is just a type of survey. Other types of surveys include face-to-face interviews, phone interviews, and polls. A survey is a research process used to orderly collect and analyze information from a group of individuals to measure opinions, thoughts, or experiences. It is a way of conducting research where individuals are questioned, with respect to their behaviors, awareness, motivations, demographics, and other characteristics. It is not confined to gathering information using questions, but it also encompasses the collection, recording, measurements, and analysis of data. A questionnaire is a form containing a series of questions, delivered to individuals for the purpose of obtaining statistical information. It is a research tool that uses questions to get information from different individuals. The questions are framed in order to obtain straightforward answers from the respondents. Additionally, questionnaires focus mainly on quantitative data unlike an interview where in depth and detailed information is accumulated.